By Ellen Davidson, Stop These Wars. Above photo: Ken Mayers and Tarak Kauff on the Shannon Airport airfield. By Ellen Davidson. NOTE: From Ellen Davidson – At the arraignment March 18, Tarak and Ken were represented by the equivalent of a legal services attorney, since it was a bank holiday and we were unable to find a solicitor at 9:30 the night before when we found out they were being arraigned. 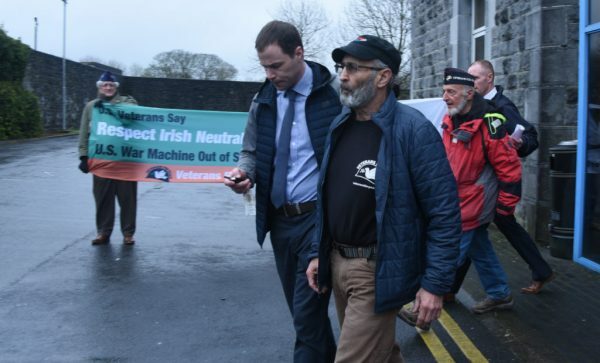 On March 19, Ellen Davidson and Ed Horgan of Shannonwatch and Veterans For Peace Ireland will be meeting with Ed’s lawyer in Belfast, who is handling a similar case for Ed. There will be a video hearing tomorrow, sort of an administrative next step of their arraignment. Their appeal of the no-bail ruling will be heard on March 28. More news then. Irish Amnesty International has been contacted, and Ellen Davidson will be contacting the U.S. Embassy in Ireland today. Tarak and Ken are settled in at the jail in Limerick. The guards so far are very friendly, it’s comfortable, and according to Tarak, the food is better than NYC jails. They are rooming together. They can make phone calls, but I imagine it’s a fairly limited privilege. There is a crew of activists in the Limerick area who will be visiting them regularly and perhaps holding vigils at the jail. The demand for the above is that Tarak and Ken be given bail and allowed to return home (to the U.S.) until their trial, which will definitely take months but could take years. They could end up serving more time than the penalty for their charges before they even get tried, much less convicted. You can also donate to defray defense expenses by calling the Veterans For Peace national office at (314) 725-6005 and making a donation. Be sure to specify that it’s for Tarak and Ken. Shelly at the national office will keep track of the funds. We hope to have an online donation option soon. And you can write to them at Limerick Prison, Mulgrave Street, Limerick. 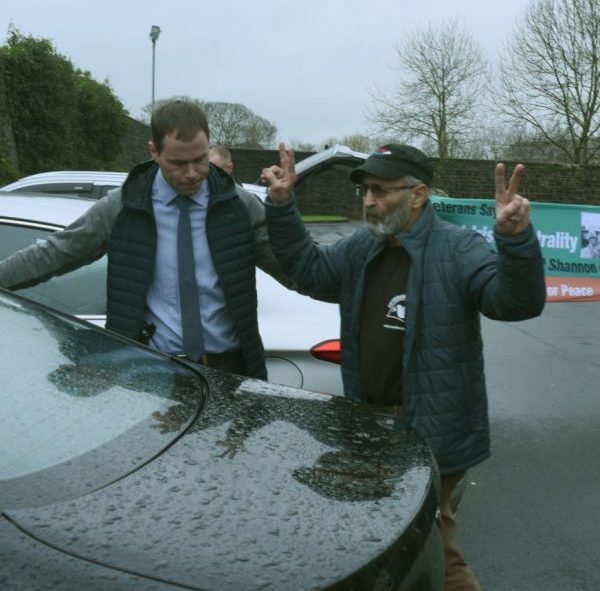 Ireland – Two US veterans were arrested at Shannon Airport on 17 March for entering the airfield to inspect and investigate an OMNI Air International plane on contract to the U.S. military. The two, Tarak Kauff and Ken Mayers, were refused bail at Ennis District Court today. The two walked across the air field with the intent of inspecting the plane for weapons or munitions, but were apprehended by airport security and Gardai. There were detained and interviewed at Shannon Garda station and held overnight for arraignment on charges of trespass and criminal damage. At Ennis District Court this morning Mayers and Kauff were represented by solicitor Darragh Hassett. The prosecution outlined the charges against them and indicated that they were opposed to bail. Garda Sergeant Noel Carroll gave evidence of arrest on Taxiway 12 at Shannon airport. He also stated that there was a US military aircraft at the airport, most likely referring to OMNI Air N351AX. He also confirmed that the defendants were both veterans of the US military. The prosecutor, Inspector Thomas Kennedy, said there had been substantial damage to the airport perimeter fence. When the bail issue was being discussed Solicitor Hassett initially stated that the defendants were prepared to agree to bail conditions that involved surrendering their passports, and remaining in Ireland for the duration of the legal processes. This was an unacceptable condition as it would mean that the defendants would have to remain in Ireland at their own expense for up to two years before the trial would occur, and this restriction amounts to punishment without trial. After the court resumed, Hassett emphasized that the defendants needed to return home to the USA and would sign a sworn undertaking to return for trial. The prosecution opposed this and continued to oppose the granting of any bail. Judge Maire Keane then ruled that she was denying bail to the accused and remanded them in custody to Limerick Prison, where they are to appear for a further court mention hearing by video from the prison on Wednesday 20 March. Further discussions were then held with Solicitor Hassett. He raised the option of appealing the bail refusal to the High Court in Dublin and he was told to lodge such an appeal. He indicated that it would likely be Thursday 28 March before this High Court appeal would be heard. Major Ken Mayers served 12 years in the US Marine Corps. He is a former National Board member of Veterans For Peace and participate in veterans peace team delegations to Palestine, Okinawa, Jeju Island, South Korea, and Standing Rock. Tarak Kauff was a paratrooper in the US Army during the early sixties. He was a member of the VFP National Board of Directors for six years. He has organized veterans delegations to Palestine, Okinawa, South Korea and Standing Rock. He is currently the managing editor of Peace In Our Times, VFP’s quarterly 24-page newspaper. It’s obvious that the Irish court has ceded its sovereignty to the powerful USA interests that want to punish any dissent in the USA and in foreign countries.